WASHINGTON (Reuters) - The Trump administration has stepped up its communications with China over trade, the White House's top economic adviser said on Wednesday, as people familiar with the effort said an invitation for a new round of trade talks was sent to Beijing. The invitation from senior U.S. officials led by Treasury Secretary Steven Mnuchin was sent to Chinese counterparts, including Vice Premier Liu He, these sources said. The outreach comes as the Trump administration prepares to activate tariffs on $200 billion (153.06 billion pounds)worth of Chinese goods, hitting a broad array of internet technology products and consumer goods from handbags to bicycles to furniture. White House economic adviser Larry Kudlow would not confirm the meeting invitation, but said that communication with Beijing had "picked up a notch. 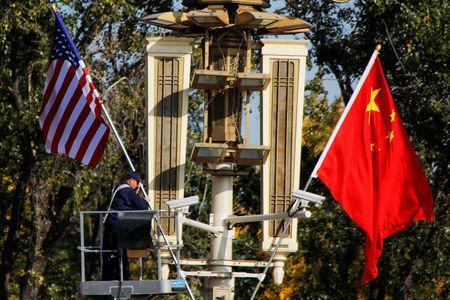 ""The Treasury Department is in communication with China. I can't go beyond that," Kudlow told reporters outside the White House. He added that he views such communication as "a positive thing." "I think most of us think it's better to talk than not to talk, and I think the Chinese government is willing to talk," Kudlow said, declining to provide any further details. Asked if the Trump administration would like to have additional trade talks with China, Kudlow said: "If they come to the table in a serious way to generate some positive results, yes of course. That's what we've been asking for months and months."